Gionee is the latest company joining the trend of edge-to-edge screens. The phone that previously appeared on GFXBench might be the Gionee M7 that was teased at the company’s official Weibo account. 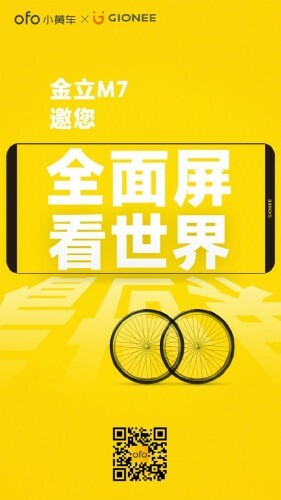 Gionee is collaborating with Ofo, a bike-sharing start-up from Beijing, in launching the M7. The image reveals two bike wheels and their arrangement hints at a dual-camera setup for the Gionee M7. If the device is the same as the benchmarked one, it might have a 6” screen and MediaTek MT6757CD chipset. The RAM will be 4 GB and storage 64 gigs. We just have to wait for Gionee to announce an official launch date for the phone, so we know for sure.